We’re closing out Horrific New Horror Week with this suggestion from my friend, Mark Carroll, a true aficionado of good horror gaming. Designed as a self-contained single session RPG experience, The Shivering Circle also serves just fine as the launch for an entire campaign of nerve-wracking and psychologically-bending horror gaming. It’s also an excellent delve into British folklore. a stone circle, where the ley lines meet. it was you they wanted all along. A ­complete role-playing game for one-shot or prolonged play. 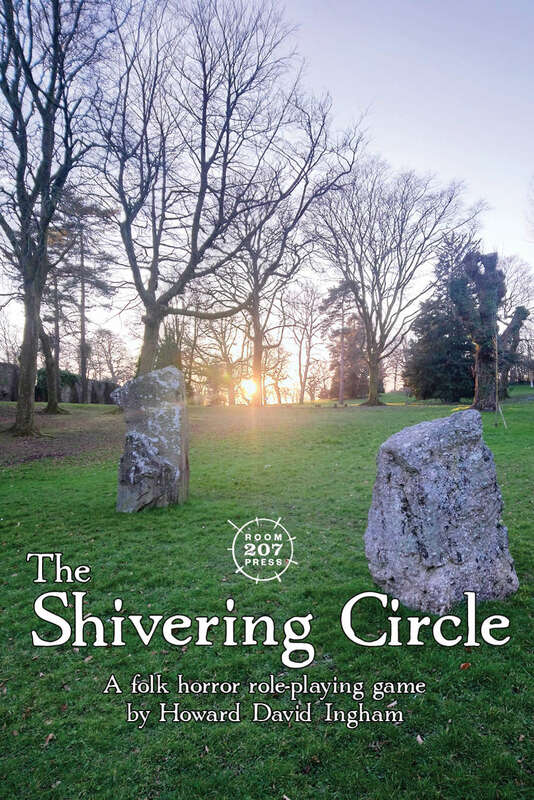 The Shivering Circle has a rules-light, intuitive system designed for quick pick-up horror games and a brief sample setting allowing you to dive into the haunted territories of British folk horror. Though not purely horror, the inclusion of a “Strands of Cthulhu” section makes this enhanced version of Fate (naturally called Strands of Fate) from Void Star a fine inclusion in Horrific New Horror Week. It’s a complete game system, not requiring any other core Fate books – pretty much Mike McConnell‘s vision for how you can expand the system to a bit more detail without sacrificing its core ideas. The wizard’s staff hums with the power of an unleashed spell. The assassin’s cybernetic arm ejects a hidden blade. The super-powered defender of New York melts the robots to slag with his heat vision. The intrepid investigator stands firm against the mind wrenching eldritch horror before him. Cleaner, clearer and more concise, Strands of Fate 2nd Edition continues down the path set forth by the original Strands of Fate; providing a stand-alone set of core rules for using the Fate game system to tell exciting stories of action, adventure, horror and intrigue across an infinite variety of time periods and genres. Core Rules – This book is fully self-contained, and contains all the rules you need for making characters and playing the game. Aspects – Full rules for the creation and use of Aspects, the popular narrative mechanic that has defined the Fate game system since its inception. Strands of Cthulhu – In which desperate investigators confront the minions of the Elder Gods. Strands of Fantasy – In which bold adventurers fight against savage and ancient evils for honor and treasure. Strands of Valor – In which heroes imbued with super powers stand against tyranny and annihilation. Strands of Neon and Chrome – In which cybernetically enhanced underdogs fight back against the oppressive mega-corporate elite. Perks and Powers – The extraordinary and supernatural advantages that separate your characters from the masses. Whether a mutant psychic, a crusty old wizard, a crazed cultist, an ancient vampire, a cross wielding priest, or a genetically enhanced cyber-soldier, we’ve got you covered. Powers are presented as self-contained special abilities that are defined with Aspects, and further detailed through the application of Limitations and Enhancements. Deviations – An entire chapter is dedicated to providing modular, variant rules that are added to, subtracted from, or used in place of the standard core rules. Deviations serve as a series of dials and switches, which can be used to tune the rules to better suit the story you want to tell. Antagonists – The Game Mastery chapter contains a number of sample NPCs and creature to challenge your PCs with, or to serve as examples when creating your own. 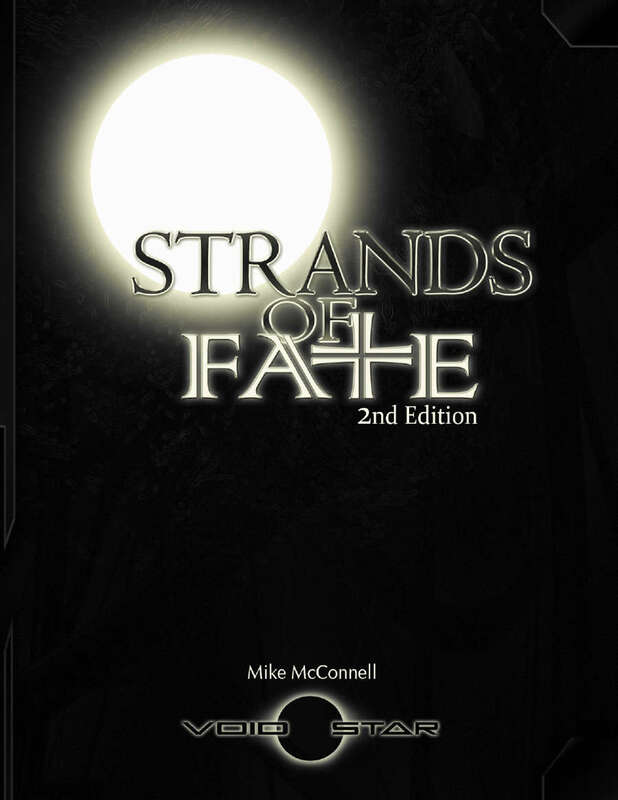 Strands of Fate 2nd Edition is a fully self-contained Fate game, and requires no other supplements for its use. It is built upon the branch of Fate rules originally published in Strands of Fate 1st Edition and later refined in Nova Praxis. Note: This is an “Augmented” PDF, and was designed with laptops, tablets and smartphones in mind. It is filled with useful links, and features a special layout purpose built to speed up navigation on a digital device. Today’s Horrific New Horror Pick is a simple, grab-and-go game that hearkens back to the “Golden Age” of comics tales of horror adventure. There’s also a lot of assumption in Terror Tales X! about your casual knowledge of d20-driven gaming of the Old School variety. It’s cheap and interesting, and certainly worth a look (along with the rest of the Beyond Belief Games series). Weird! Baffling! Terrifying! Rousing tales of macabre adventure using familiar rules! Who wants to read through reams of text just to get to the action? No-one right? These rules assume you know how to role play. 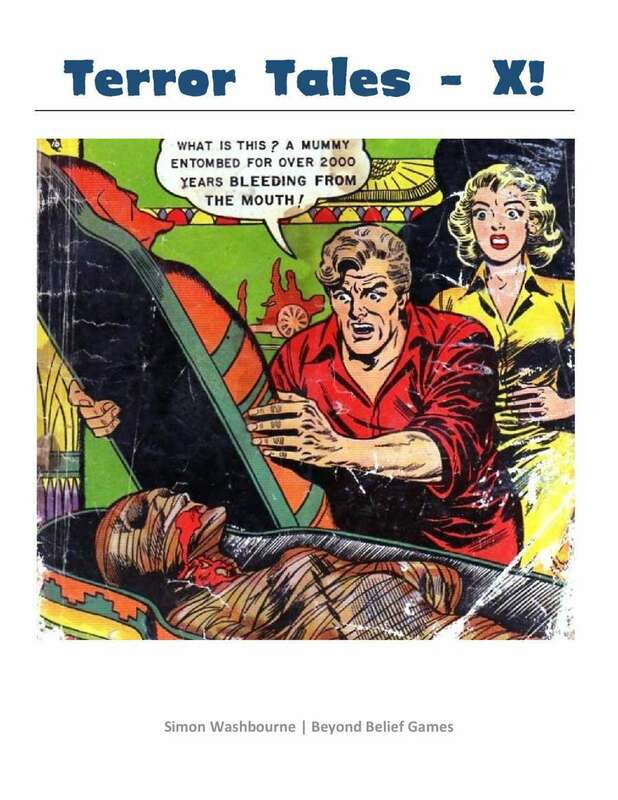 They assume you know about “Golden Age” comic book pulp mystery fiction. (Thrilling adventures through a retro lens). They assume you know how OSR products work. There, it’s done. You know how to play already. Just get on with it. Two-fisted tales and mysterious investigations. 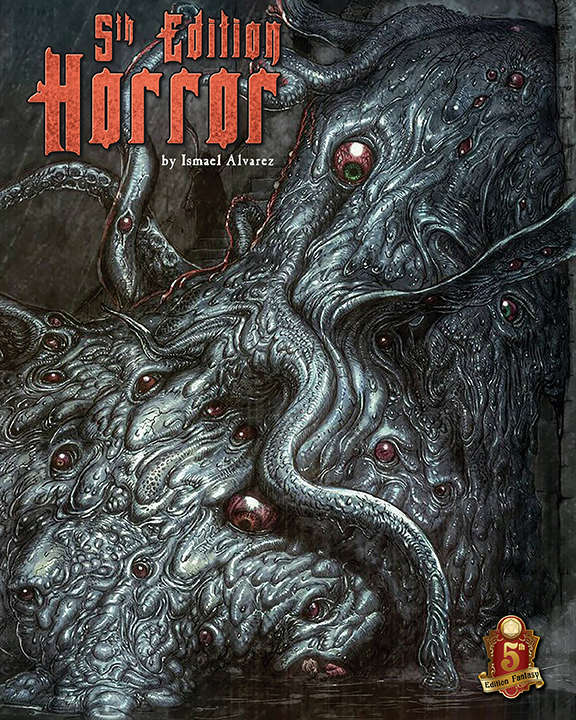 Today’s Horrific New Horror Week Pick is a special resource for anyone running any version of Lovecraftian horror, no matter the system. The folks at Cthulhu Reborn crafted this immersive prop that enables players to search through the articles and adverts to find valuable clues and tantalizing references, enhancing their in-game experience and while providing GMs more hooks to play off of. Bring H.P. Lovecraft’s Arkham to Life with a Lavish and Detailed in-world prop: a full cover-to-cover issue of the Arkham Advertiser from 1928. 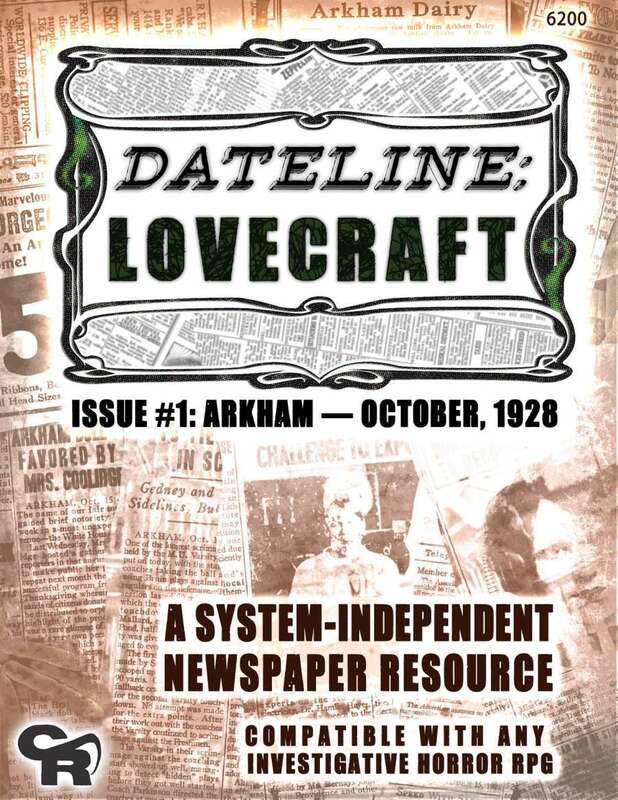 Dateline: Lovecraft Issue #1 is a system-independent resource to help both Game Moderators and players of investigative horror games evoke a more nuanced and vibrant Arkham. The core of the package is a large and lavishly-researched and period-authentic newspaper prop, the full edition of the Arkham Advertiser for the day of Monday, 15 October, 1928. Buried in the thousands of words of news, advertisements, editorials, columns, society pages, and other weirdness, lies a wealth of out-of-the-ordinary hooks which can be used as the basis for game scenarios. Picking up some of these strands, an imaginative Game Moderator can weave his or her own evocative Arkham tales of terror. Tales imbued with an authentic 1920s tone, and the unique quirky feel of H.P. Lovecraft’s brooding town. A sample system-independent investigative horror scenario which ties closely into articles from the newspaper. I’m baaaack! Last week was the Gathering of Champions Epic Road Trip, and this week, I am at Denver Startup Week with my COO, Michael Surbrook, as we explore “next level” efforts for Evil Beagle. Still, gonna try to get this week’s Picks done as I go, and it’s Horrific New Horror Week this time around, starting with Fat Goblin‘s 5th Edition Horror. The book is dedicated to taking your 5th edition fantasy gaming deep into the territories of dread, madness, terror, and darkness, and Fat Goblin is a solid house doing great work. Horror is a feeling, a place in your mind, and for some, a final destination. Some mad few wish to know the little terrors and the vast dead that populate the dark places between the light, be they candles or stars. The only thing between you and the fiends and fright contained within is the heartbeat that it takes to access the forbidden knowledge within. If you have ever wanted to play in a 5th Edition Fantasy setting that is heavily influenced by horrors of madness, violence, and grotesqueness, by all means, acquire this book. * Character archetypes for every core class. * A brand new class, the Apothecary, that mixes potions and uses new and untested sciences to explore a dangerous world. * New spells, feats, and even modified skills to help you gear your game towards a horror campaign. * A multitude of new monsters meant to turn your stomach, addle your mind, and haunt your dreams. * A treatise on villainy, with modifications for deranged murderers and disturbed masterminds. * Advice on how to make your games spooky, dreadful, devilishly short, or even existentially doomed. There is plenty for player and game master alike to fuel a campaign of horror for 5th edition fantasy, and enough to paint a character or setting into dreary stories of woe and ruin. Seek it out at your own risk. And we end Super New Week with a major product for one of the preeminent superhero RPGs of all time, the Mutants & Masterminds Basic Hero’s Handbook. Recognizing they’ve added a lot of stuff to the 3rd edition, the Green Ronin folks figured it would be a good idea to put out a beginner’s manual to help newbies get started. Hope you all are having a grand time – tomorrow is the Big Game I am running for some of superhero gaming’s royalty! Every hero needs an origin story and this can be yours! Written with new gamers in mind, the Basic Hero’s Handbook streamlines and clarifies the flexible, robust third edition rules of Mutants & Masterminds. With simplified character creation and a selection of ready-made adventures, the Mutants & Masterminds Basic Hero’s Handbook lets players jump right into the action. The book is fully compatible with the Deluxe Hero’s Handbook and the entire library of third edition Mutants & Masterminds supplements, instantly expanding your character options and adventure potential. Whether you’re just getting started, or want an extra player-friendly reference at the table, the Mutants & Masterminds Basic Hero’s Handbook is the choice for your world-saving needs! Ah, the rolling hills and crashing waves of Northern California (especially San Francisco!). Love it here! Meanwhile, I hope you’re loving Super New Week, with today’s Pick – Era: The Empowered – giving you a new way to play superheroes. The premise here is a “real” world where superpowers emerge (but they go way farther than Heroes ever did). 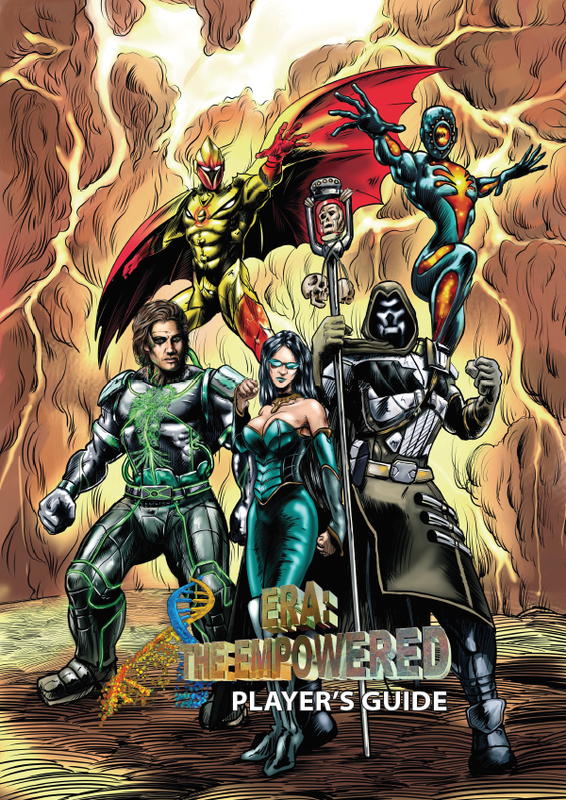 Era: The Empowered is a Tabletop RPG based in a world where superpowers are real. Across the world, individuals are emerging as heroes and villains. Five years in the making, Era: The Empowered offers an opportunity for balanced characters with all types of abilities, from super strength to resurrection! The innovative Power Tree mechanic, designed and integrated into the Era d10 rule set for this game, provides the opportunity to build whatever powers you want. 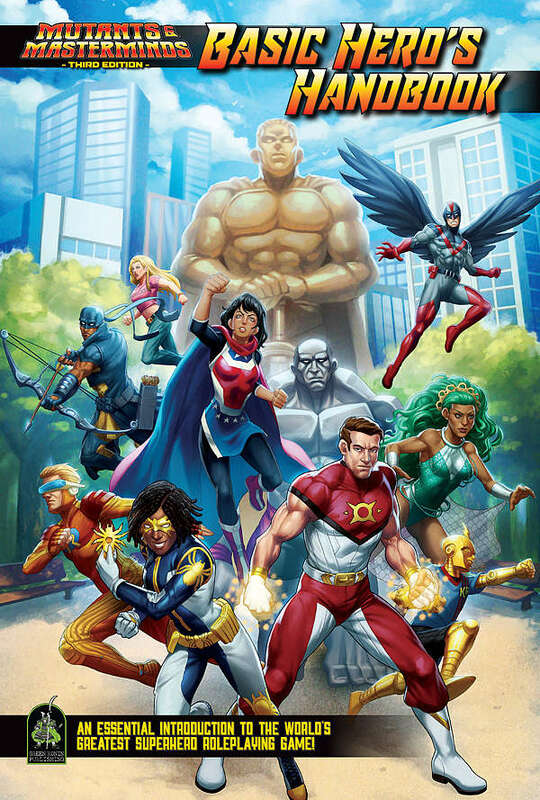 The game’s timeline follows through 5 years, during which the first telltale signs of Empowered appear, Atlantis’s forces rise from the ocean to attack the surface, the return of the Old Gods and culminates in the formation of the Empowered Department. Through these events, it’s possible to play any type of superhero game you like, just by choosing where in the timeline the characters exist! 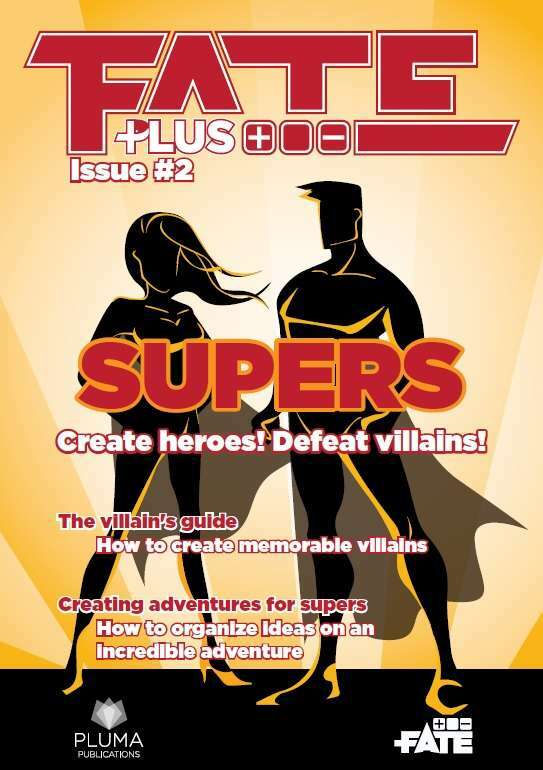 While Michael “Avalon” Surbrook and Jonathan “Flux” Catbagan and I make our way westward to Northern California for a “Gathering of Champions,” here’s another Super New Week Pick, a series of helpful “ideas, adventures, tools, and new rules” for you to use in your superheroic-themed FATE campaign – FATE Plus #2: Supers. You’re a superhero. Save the world! This product contains files in PDF, EPUB and MOBI format. New superpowers using the Venture City rules. Fate Plus is a monthly zine that creates new ideas, adventures, tools, and new rules for Fate Core and FAE (Fate Accelerated). Fate Plus was originally published in Brazilian Portuguese. Now it’s getting its English version. We’re at Patreon, publishing new material on issues with about 7000 words of original content every month. Support our work! 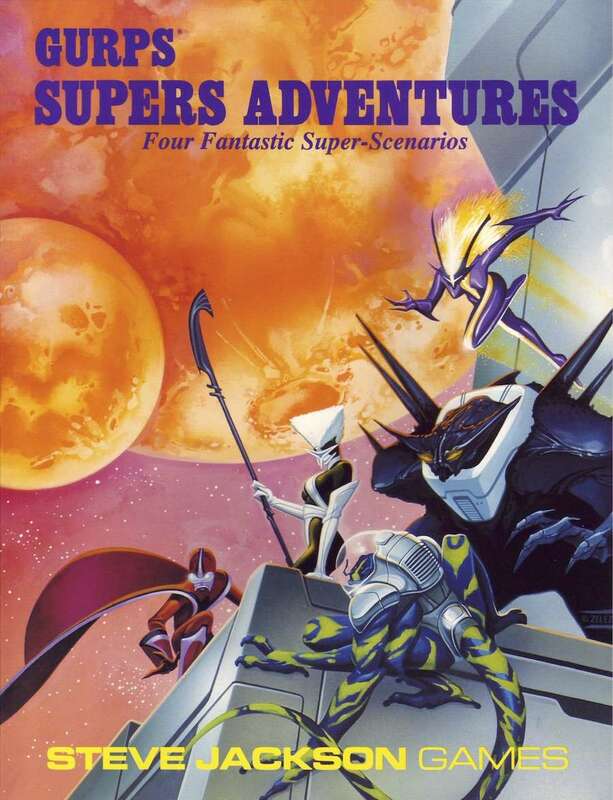 As we continue with Super New Week, here’s a classic GURPS supplement (recently added to DriveThruRPG), Supers Adventures. 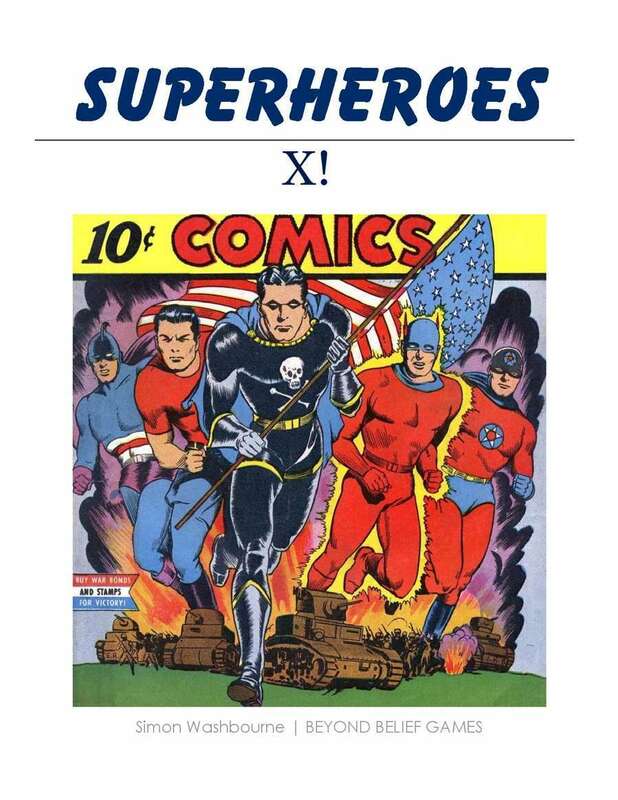 While many will agree that superheroes were never a strong suit for the GURPS system, there’s some great writing and design of adventures in just about everything they published, which makes this a great resource for whatever system you’re running. Lots of adventures and great ideas here! Saving the world isn’t just an adventure — it’s a job! GURPS Supers Adventures is a mind-boggling ride from the depths of the oceans to the far corners of the galaxy. In Jupiter Blues, the heroes must quell a rebellion on Jupiter’s turbulent moon, Io. Can they handle the mind-controlled Raveners, or will they end up buried in a cold, dark mine shaft? Mark of the Kraken, a two-part adventure, sends the costumed crusaders into the ocean at the behest of the U.N. Can they stop the watery menaces in time, or will the Green Dawn eco-terrorists use the deadly Kraken to drive mankind from the oceans forever? Finally, Web of the Zyrani takes the supers on a surprise cross-galactic trip to find a missing team of scientists. After visiting the high-energy planet of Zyrane, they’ll never be quite the same again . . . Although set in the world of GURPS International Super Teams, these adventures can work in any campaign world for any team of heroes. Guidelines are given to help the Game Master increase — or decrease — the dangers facing the team, allowing each scenario to be perfectly tailored to the campaign. Each adventure includes all necessary maps and diagrams, and can be completed in one or two long game sessions. In honor of my westward road trip (where I’ll be running a Prowlers & Paragons: Ultimate Edition* game for the original Hero Games guys – George “The Golden Swordsman” MacDonald, Steve “Goliath” Peterson, Ray “Dove” Greer, and Bruce “Marksman” Harlick – I am declaring this Super New Week, and we’ll take a look at the latest and coolest superhero products out there. We’ll open up with this latest take on using Old School Rules (of the D&D variety to play superheroes who level up – Superheroes Extended. Thrills! Spills! Action! Adventure! Superheroic action using Light rules! Who wants to read through reams of text just to get to the action? No-one right? These rules assume you know how to role play. They assume you know about superheroes – especially those of the Golden Age. They assume you know how OSR products work. There, it’s done. You know how to play already. Just get on with it. Biff! Smash! Bam! Kapow! Superheroes Extended takes characters to 6th level. If you want a lighter (and for a lower price) version of this game, check out Light Superheroes, which takes characters to 3rd level and has fewer options for quicker character creation.